Have you ever secretly thought, "no matter what I do I can't get ahead...I need the right people/team or equipment to attain what I want...I don't have enough money to get what I want..." or all of the above? If you whispered "yes" then I have good news for you! None of these things are your real problem. A lack of support, money, resources, and everything else you think of will never be the reason why you don't achieve your goals! The only thing that can stop you from getting to where you want to be is you. All of the reason listed above are only resources! They do not make or break your success. Yes, having excess money and a smart team of professionals around you will help to get things done a lot faster, however, every successful person that you can think of (right now think about those specifically in your industry) started off where you are with almost nothing and sometimes even less than that! What you need isn't more insightful strategies, clever information, or generous support. 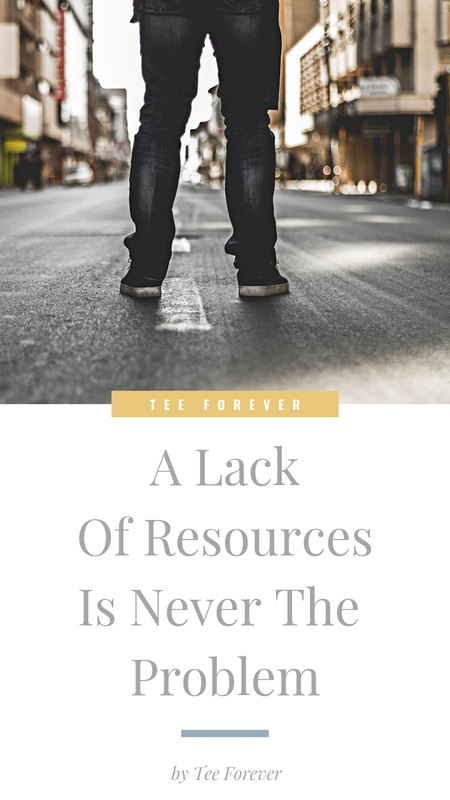 You need to become resourceful! Look at the things that you feel are holding you back and FIND SOLUTIONS! Obstacles are only opportunities for growth. They are not meant to slow you down or distract you instead they are apart of your growing pains! You would never expect to survive climbing the highest mountain you've ever climbed in your life without first properly training and preparing for the event, right? Well the same principle applies to your life! If you want to go further than you've ever gone you have to stretch yourself. If you want to go to the next level, start maximizing your potential, and really see satisfactory results with your goals you have to challenge yourself to see options where others see nothing at all. Developing your mind, beliefs, perspective, and self-awareness will help you to become more resourceful. While on this journey you will also have to turn your excuses into the driving force behind why you can and will achieve your goal(s). There is no reason on earth why you can't achieve success in whatever you want. I talk to tons of people every day who have dreams of creating a life they enjoy, but when I ask them why they haven't started creating it they say things like "it's not practical, I need to make a living, I have to earn good money, I don't know anyone who is doing it/has done it..." and so on. I can't tell you how sad I feel when I hear the hopelessness in their voices. They not only feel trapped because they think they can't live a purposeful life, they also feel like settling for less than what they want is acceptable. Guys! This is madness! Why limit yourself to the experiences of those around you?! There are ENDLESS possibilities in the world, endless opportunities waiting for you to become resourceful and find them, and endless doors waiting for you to open them! You're not stuck living the life you're currently living unless that's where you want to be. Although they may not realize it, they are actually stuck in a fear-based comfort zone that will continue to hold them hostage if they don't start dreaming about all the beautiful things life has to offer them again. The truth is, I can understand the logic behind some of these thoughts and beliefs. However, if they dig deep they will realize that these are only excuses. We literally have access to the world at our finger tips. Anything we want to learn is available to us online. Any skill we want to develop can easily be executed through self-discipline and focus. Anything we want to do is waiting for us to figure out how to do it! Creating a life that we enjoy now, in 2019 is not as hard as it was years ago! Don't allow fear, excuses, or lack to turn you into a 9-5 zombie. If your heart desires to have full control over your time and generate good income while doing something you love then go for it! Don't settle for the average, mundane life that offers you no freedom to express your creativity and uniqueness. You were created for more! Believe that what you want to achieve IS possible and find a way to get it done. Stay inspired by reading autobiographies and biographies by people who have faced similar challenges to you and have overcome. Read leadership and personal development books that expand your mind and teach you how to become the person that you see yourself being. Get around successful people and start doing the simple things that they do like showing up to meetings early, resting your body, being grateful, and working smart (not hard). If you know that you're capable of crushing your goals then I want to see you taking bold massive action steps toward them. Find a way when things seem impossible. Push through the noise when everyone around you says it's not possible. Do what you have to do and become resourceful. Don't let another year slip through the cracks. Your goal(s) are yours for the taking if your ready to go get it. Until next time, xo!